Share your files in the cloud. Show off your talents by uploading your music, videos and images, and sharing them with the world. The FileFactory File Manager makes it easy to manage your files. Start Sharing - It's Free! Copyright Policy and Child Exploitation Policy. A truly unlimited file sharing service. FileFactory has always been the best place to upload and share files with no limits, since 2005. Upload, send and receive any type of file up to a massive 5GB, with unlimited file bandwidth. Upload, store and share your music, videos, images, documents - in fact, almost any file type and format is supported. Fair Use Policy applies for accounts storing more than 5TB. Go Premium for no hourly or daily limits on downloads. Third-party download manager support for faster download speed, resume downloads and download multiple files at once! Each file can be up to 5GB in size. For free members, files are only removed after 30 days inactivity so popular files remain active. Fair Use Policy applies for accounts storing more than 5TB. All files can be downloaded an unlimited number of times by an unlimited number of people. Share your original mixes. Upload, share and stream your audio files on our site, for free. Allow anyone to upload files to your account to review with your own Filebox uploader. Share your file links on blogs, forums or social media like Twitter and Facebook. File sharing finally made simple. 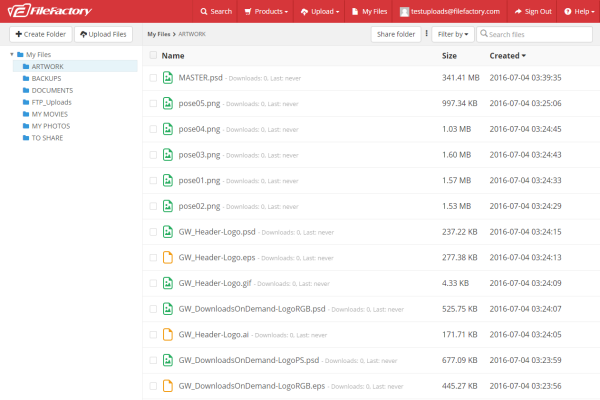 The FileFactory File Manager makes uploading, downloading, sharing and organizing files simple. Duplicate a file from another FileFactory member into your account with a single click so you have your own personal copy. Keep your files safe! Password protect files and folders easily. Only the person who knows the password will be able to download your files. Premium users can speed up downloads and resume broken downloads using a large number of download managers. Download your files from any Internet connected device. Every file can be shared and downloaded an unlimited number of times. Upgrade to FileFactory Premium now. Unlimited downloads! Unlimited speed! No popups! What are you waiting for? FileFactory is a leading provider of unlimited free file hosting. All files can be downloaded or streamed an unlimited number of times and Premium members enjoy unlimited speed, bandwidth and downloads.